I have all sorts of exciting plans for this year, one of which is setting up my very own Patreon. For those who don't know what this is, Patreon is a site where artists of all kinds, from authors to illustrators to bloggers, can set up a page to offer exclusive content to and create a community of patrons. 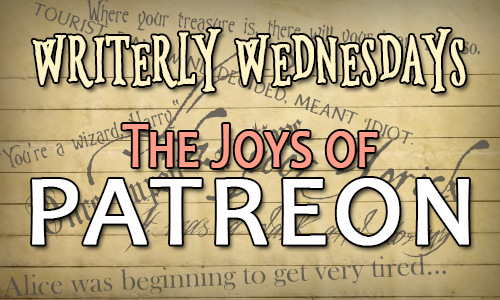 Some people use it and ask patrons to pay on a per creation basis, others ask patrons to sign up for a period of regular donations, anything from $1 up. It's an old traditional system brought into the 21st century for the internet age. I've decided to take the plunge because I love to produce content and I would really like to get closer to my readers too. I originally created my Patreon account some time ago, but I have been nervous about jumping in and actually becoming a creator. It's a bit daunting! Since I am in the setting up stage at the moment, I thought I would share my experiences as I go along in case anyone else is thinking about doing the same thing. Intro vid - this is optional by highly recommended since apparently vids engage more people -we live in a visual age I guess :). Luckily for people like me, Patreon has plenty of information about how to create these things and the best practices for doing so. They have heaps and heaps of helpful stuff to read through and watch, which is what I am in the middle of at the moment. There are so many decisions to be made, like what content to offer, how to set up tiers of access, how to make everything sustainable. It's really exciting, but really daunting too. Watch this space for updates as I plan everything out! Do any of you already use Patreon? Any advice for a newbie like me? Many thanks.